Building a good team composition is based on identifying the core strategy of both teams, and picking champions that counter the enemy strategies while synergizing with your own. Understanding Poke, All-In, Disengage, and Sustain compositions will increase your chances of winning. How Do You Build Good Team Compositions? However, keep in mind that Poke and All-In are offensive techniques, and Sustain and Disengage are defensive techniques. As a result, combining them allows for maximum effect. Teams generally do not have all one type of champion strategy. However, certain ones work best to cover the weaknesses of the core comp. Poke + Disengage: This strategy allows for continuous poke, and prevents your team from getting killed instantly by All-In compositions. All-In + Sustain: This strategy works well to keep your team healthy enough for an all-in attack. Poke + All-In: This combination works best with champions that do a bit of both, such as Jayce. By whittling down the enemy before engaging, your chances of success are greatly magnified. 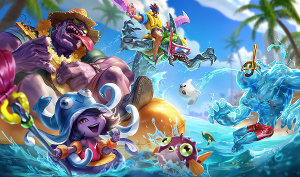 All-In All-In: This is a pure core strategy focused on jumping in to burst down the enemy champions faster than they can respond with disengage or sustain. Poke champions generally have some sort of long-range ability, and generally some sort of burst damage or crowd control to go along with it. Examples of poke champions include Morgana, Jayce and Lux. This type of team focuses on kiting and does not necessarily need any form of hard engage or tank. Sustain champions keep your team healthy or themselves healthy. These include mostly support champions like Soraka or Nami, but can also include champions like Nidalee or Kayle. They fit into nearly any composition. These are mostly the champions people enjoy playing the most, and includes notables like Rengar, Hecarim, and Kennen. Because they have no easy way of exiting once they enter the fray, most all-in champions need to be either extremely high damage, somewhat tanky, and/or have some form of AOE crowd control. This type of team generally relies on strong area of effect spells. As a result, playing disengage champions with this team may actually reduce your team's chances of victory (ex: Janna ulting enemies away from Kennen). In the current meta, the primary form of "disengage" revolves primarily around Janna and Poppy. Gragas can be used as well, but most players choose to use him as an all-in type of strategy instead. There are obviously some champions that can do all three, and some that excel at only one or two. All-in compositions will need mostly 1 & 2, whereas poke compositions will need mostly 1 & 3. Building an appropriate team composition is really easier than it sounds. By taking a look at what your team has already selected, it's fairly easy by 3rd pick to start building some good synergies and counter-picks. Got any more tips on team building or questions you'd like to post? Comment below!